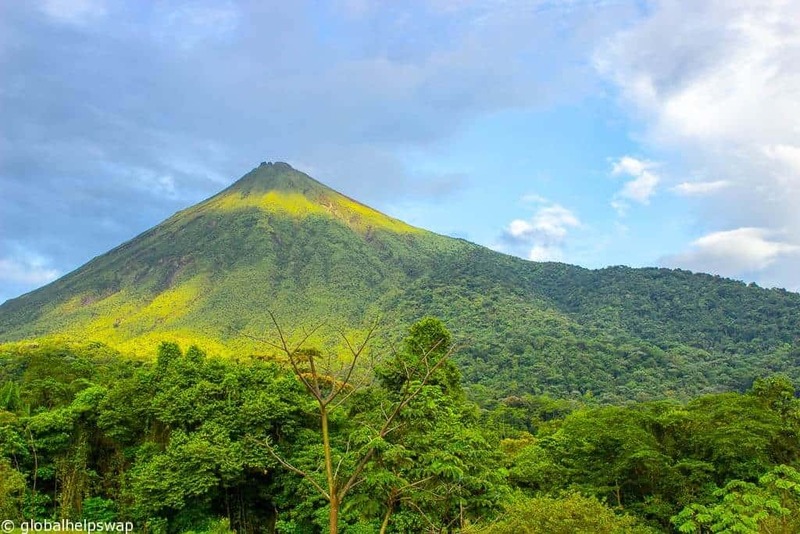 Volcan Arenal (Arenal Volcano) is an active volcano 90 km from San Jose, Costa Rica’s capital. It last erupted in 1968 destroying the nearby town of Tabacon but the volcano has been dormant since 2010 so I wasn’t too worried as I sat there sipping my morning coffee. 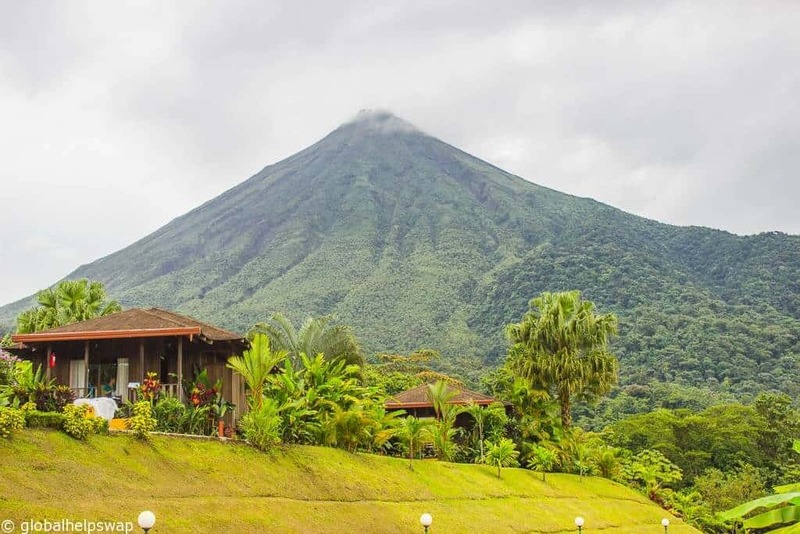 Volcan Arenal is located in Arenal Volcano National Park which is in the Northern zone of Costa Rica. The park is popular with travellers who are interested in wildlife. It wasn’t surprising I heard so many birds singing on my first morning as the park has 850 bird species within it. 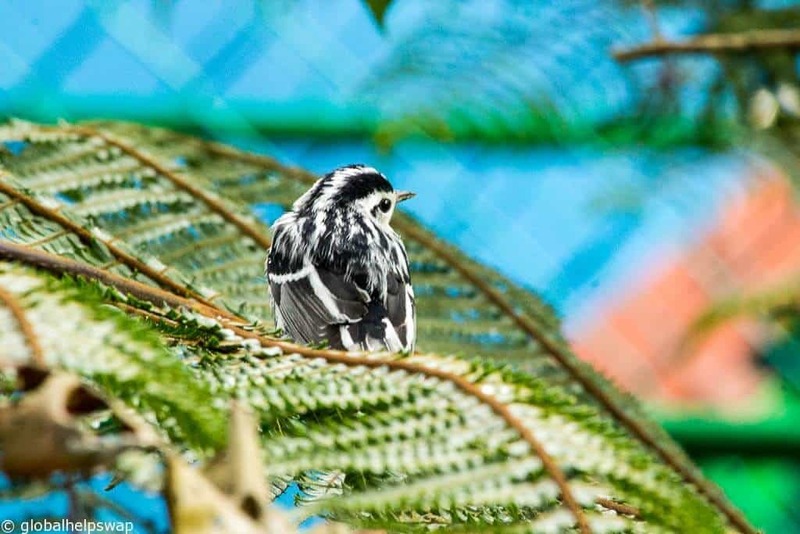 When you consider that the whole of the UK has 574 species of bird, Arenal Volcano National Park is a bird lovers paradise. 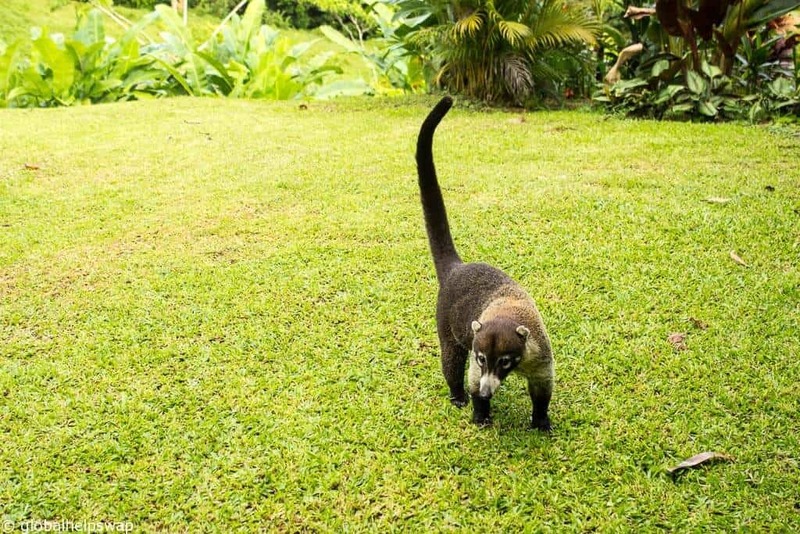 Along with birds, the park is also home to monkeys, jaguar, deer, snakes and our friend from above the coati. I couldn’t believe how friendly he was. I was just sitting there, enjoying the view when he walked across the grass right up to me. He hung around for at least 30 mins before he decided to wander off again. 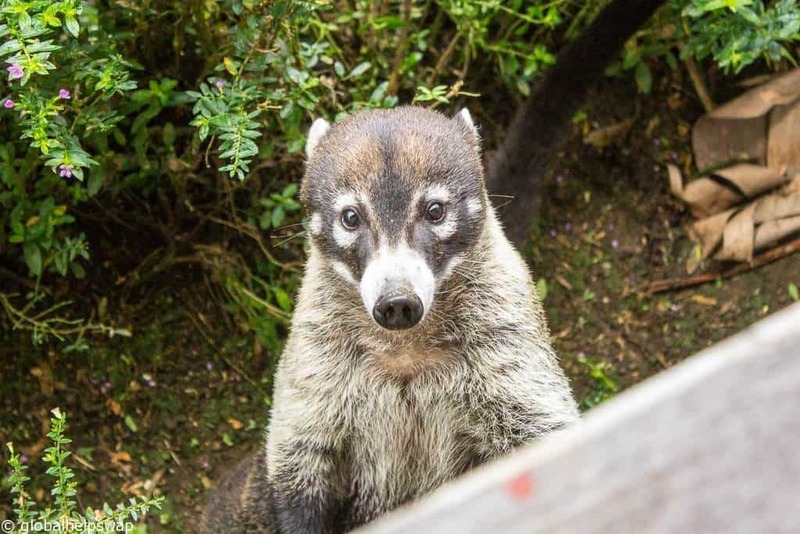 Coati’s are members of the Racoon family. They mainly eat small insects and fruit and they can live up to 7-8 years in the wild. From my experience they can be very inquisitive too! 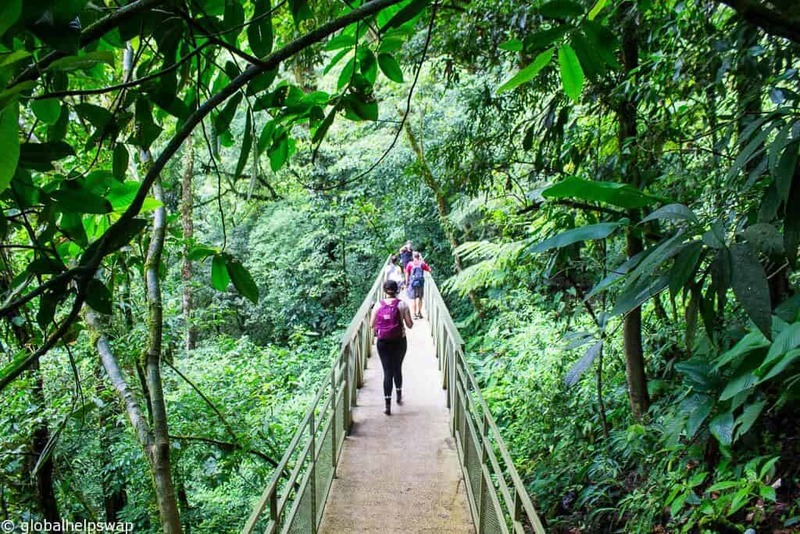 Aside from observing wildlife, the other main activities to do in the area are trekking, ziplining, stand-up paddle boarding, white water rafting, mountain biking and soaking in the hot springs. 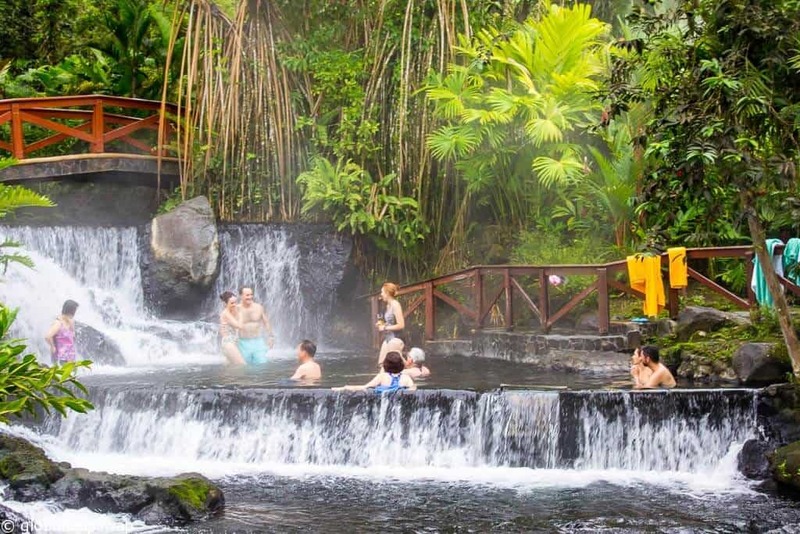 Most of the hot springs are located in La Fortuna. There are a mix of free ones and resort type ones. We didn’t visit the free ones but from what I read they are a bit more rough and ready than the resort ones but you are saving around $70 so that is to be expected. 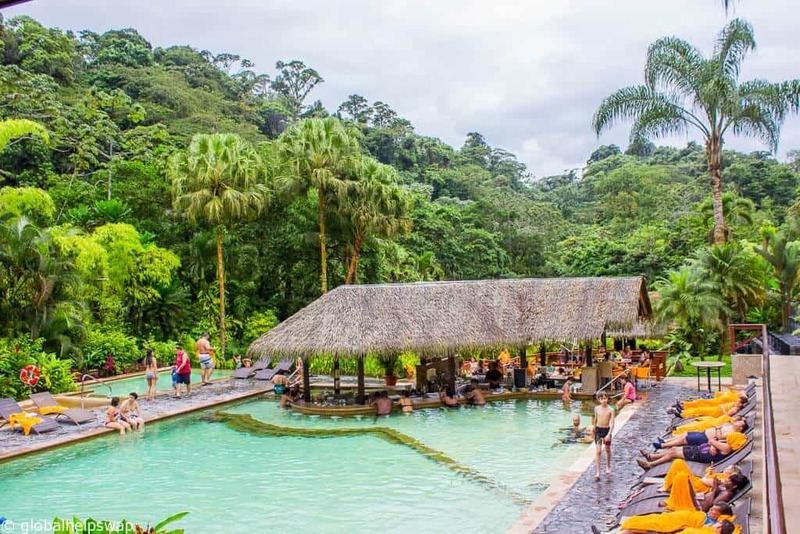 We spent the night at the Tabacon where their thermal experience was pretty spectacular. They have created natural looking pools that are surrounded by nature. It is very similar to how the Japanese create their onsens (hot springs). To sit under the stars drinking beer whilst sitting in a hot spring is pretty special. What I liked about the Tabacon was that each hot spring had a different vibe. There was the party hot spring with a swim up bar in it, there was the romantic one that was small and secluded and then there was the social ones where you can sit around and chat. The $70 entry fee also includes a delicious buffet dinner. Depending on your budget, I would say it is worth splashing out on the experience. 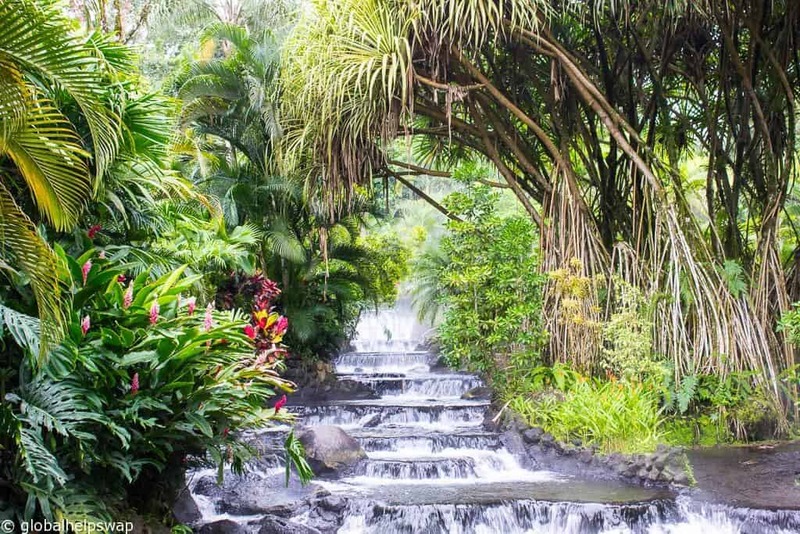 The Tabacon also has the highest rating (5) for sustainable practices given by the Costa Rican tourism board so you can sit and soak in the hot springs knowing that the hotel is doing the right thing when it comes to the nature around you. You will be happy to know that we didn’t just sit around all day during our visit to Volcan Arenal. One morning we woke up bright and early to trek down to the base of a 70 meter waterfall to have a swim. 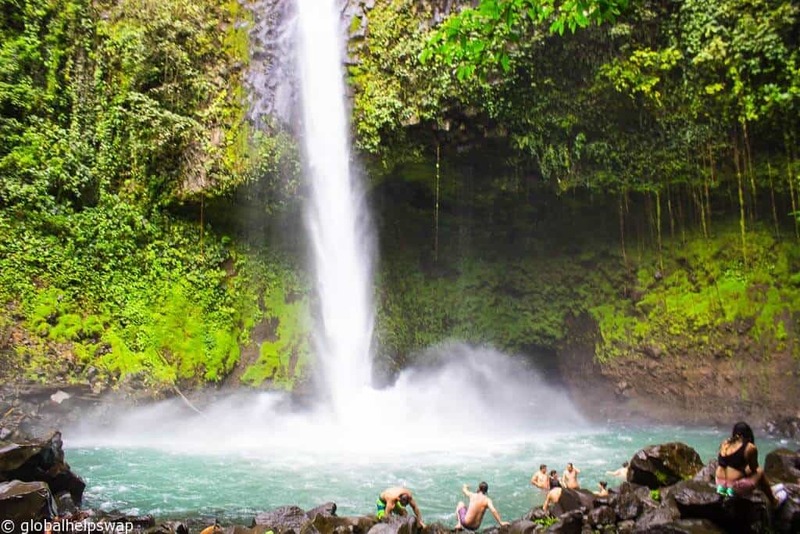 La Fortuna waterfall is located at the base of the dormant Chato Volcano 5km outside of La Fortuna town (they do like their volcanos in Costa Rica). 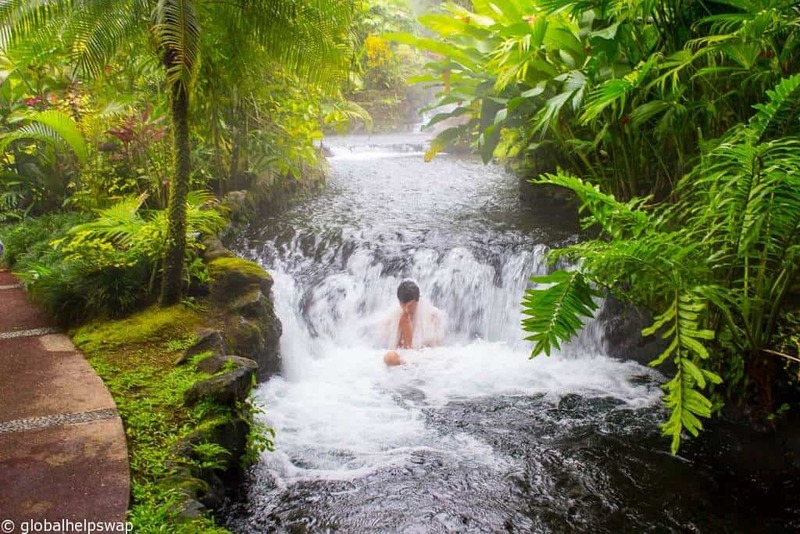 It is fed by the Arenal river which travels through the rainforest before plunging off the cliffs to create a beautiful natural shower, which was bloody cold! No wonder only a few people were in the water. The entry fee to the park is $15. There are changing rooms and showers at the top of the trail and a lifeguard on duty next to the base of the waterfall. We also went trekking in the rainforest one afternoon. I soon realised why they call it the rainforest. I have never seen rain like it, and remember, I am from the UK! Even in the tropical downpour, the trek was very special. Everything around us felt alive. Even though there were 10 of us trekking, we were all quiet as we walked, listening to the cacophony of sounds around us. I would have loved to have stayed in one place to see what animals were making those noises. 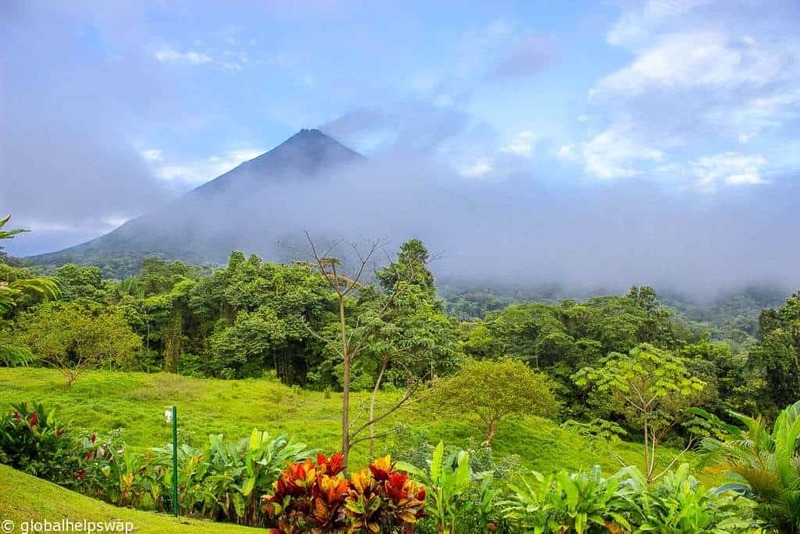 Volcan Arenal is a perfect introduction to Costa Rica. 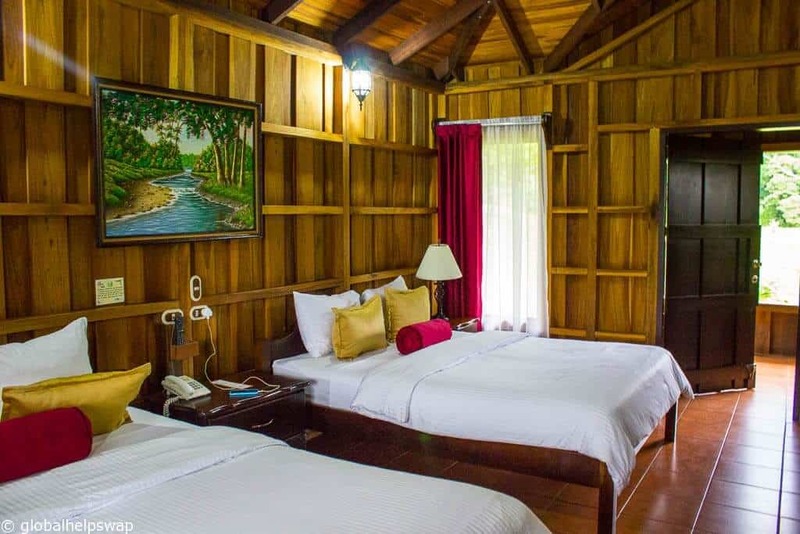 The area has loads of fun and easy activities to do, there are all types of accommodation to suit all budgets and the local restaurants serve up delicious cuisine. 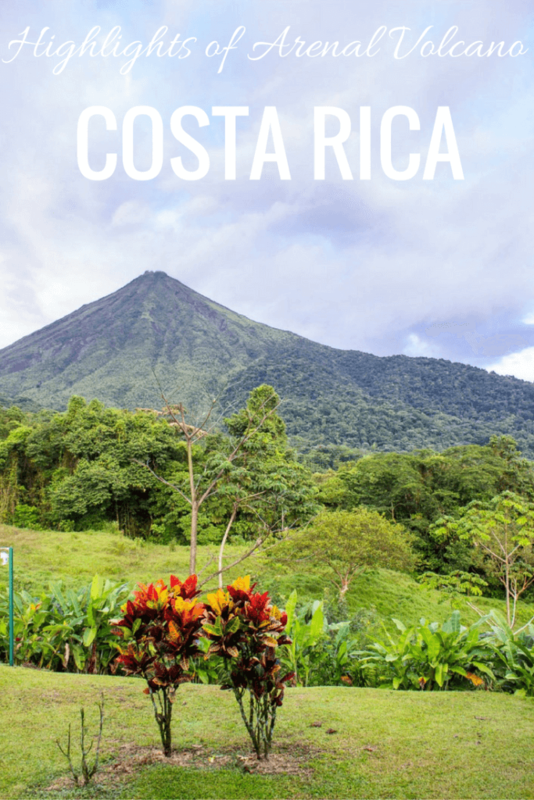 If you are heading to Costa Rica add Volcan Arenal to your itinerary, you will not be disappointed. My room was the last one, right in front of the volcano! Where did I stay to have THAT view of the volcano? 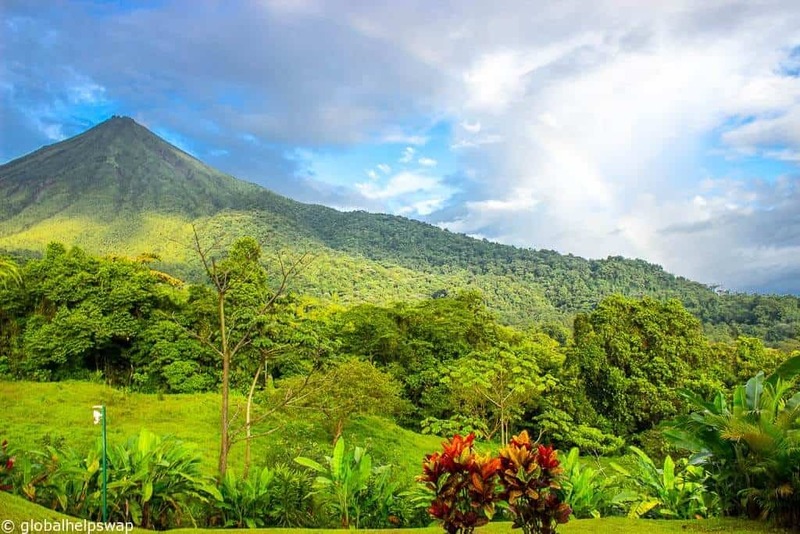 Lomas del Volcan is in the perfect location to sit and admire the volcano. I loved my bungalow so much, I felt like booking it for 3 months so I could just sit on the verandah every morning and write my magnum opus. 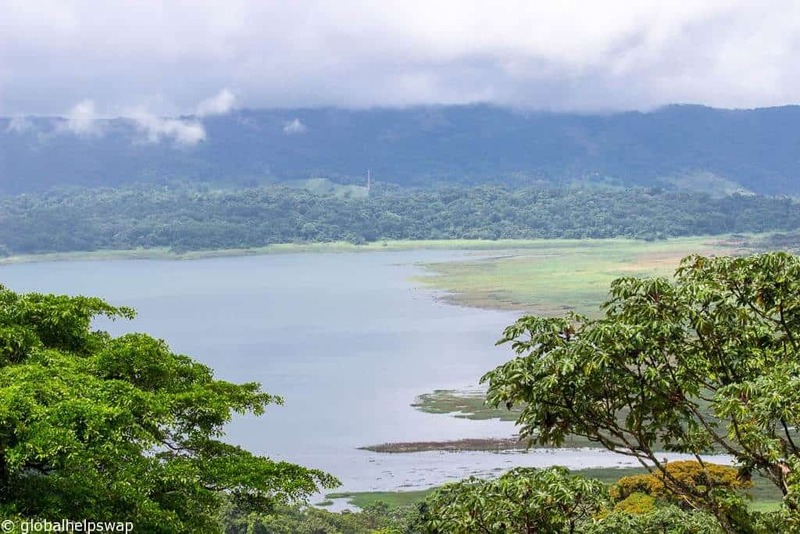 The best beach to see Turtles in Costa Rica – If you want to witness one of nature’s most beautiful spectacles, then read this post. Omg it just sounds wonderful,I want to go and live there ? 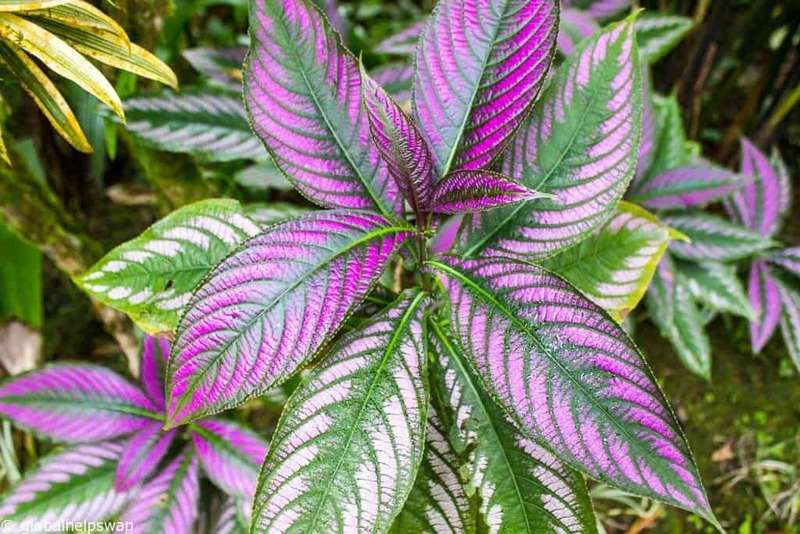 Wow, I have never seen a volcano with such greenery around. Loved the hot springs too. Did they have medicinal value too ? 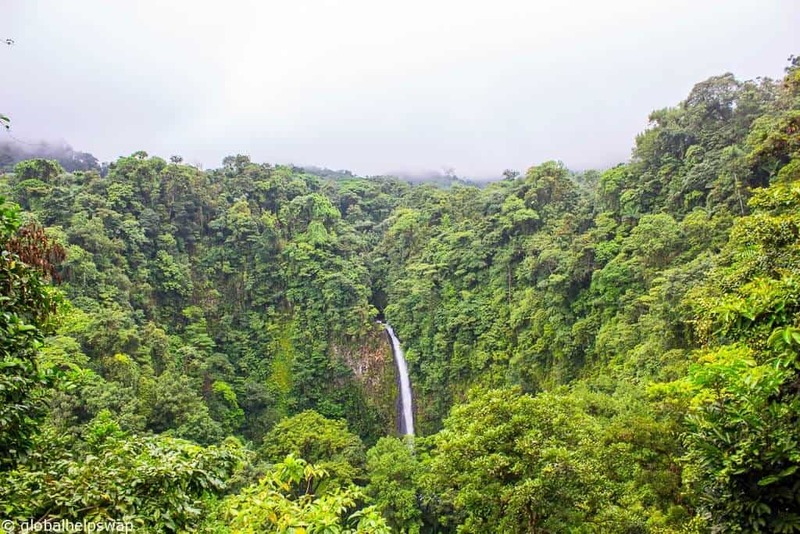 Costa Rica is green all over! We are not sure but they certainly relaxed us! Thanks for the comment. Hi! 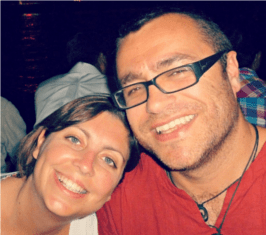 How many days did toi spend in arenal? We were there for 3 days which is about the right amount of time.